Here is just a quick review of my latest golf rounds over the past 2 weeks. Unfortunately, I didn’t play my best golf and my scores are a reflection of that…I had a lot of great shots over these 3 rounds, but couldn’t avoid sprinkling in some large numbers. I had two triple bogey 6s on two different par 3s during these rounds, very uncharacteristic for how I’ve been playing lately, but I just left myself in some absolutely terrible spots on the holes and it cost me. I’ve been working on the plane of my swing over the past couple weeks as I mentioned in my previous post and I’m still working on being able to repeat it consistently. When I get it right, I hit the ball better than I ever have before, just perfect contact, height and ball flight, exactly what I’ve been searching for. But in working on this change, I have a tendency to leave the face slightly open on impact, blocking shots to the left. I’m not doing it too often, but often enough to seriously affect my scores right now. My contact is a lot more consistent with this swing change, I’m just going to keep grinding and we’ll see how it goes in the next few weeks. My putting continues to be a struggle however and it is the part of my game that is costing me the most strokes right now. My short putting has been solid, but it is my lag putting that is just killing me. I can’t get the long putt speed right with this heavier weight in my putter right now. I had 3 3-putts at Riverwalk, 4 at Vineyard and 1 at Doubletree…this just can’t continue to happen. 31-35 putts a round is unacceptable in my opinion. Shooting (+4) or (+5) with 35 putts is ridiculous…I’m hitting enough fairways and greens to be shooting under par consistently, if I could only get my putts to 27-30 a round. I will get there eventually, it might feel impossible to me right now, but I know that it is possible to do it, so I’m just going to keep telling myself that it’s possible. 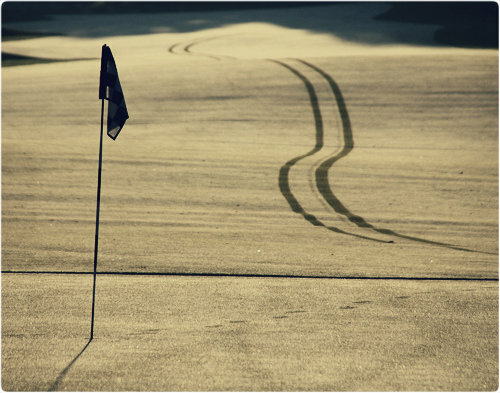 I’ll have to start spending more time on the putting green with longer putts…I can do this! So here are the round stats for these past 2 weeks, hopefully I’ll get out a few times this week. Wow!! Almost had my first hole in one this past week! A 149yard 9iron, just hit a perfectly flush high shot right at the flag just about a half inch to the right! 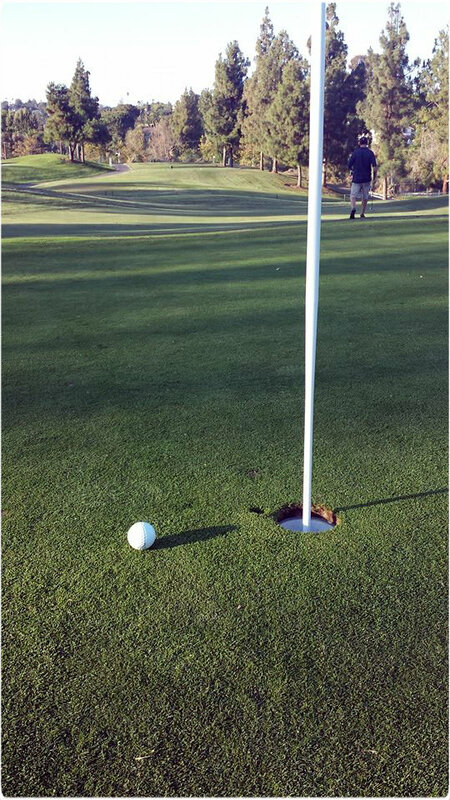 You can see how close the pitch mark is from almost flying it in the hole. I’ve had a lot of near misses over this past year, but the golfing Gods continue to deny me! If I keep firing these darts at the flag sticks, one day, luck willing I’ll get one to fall. Overall, I actually had a kind of a disappointing week in terms of scores. Hit a few drives that found the out of bounds and a couple 3 putts sprinkled in here and there during the rounds. 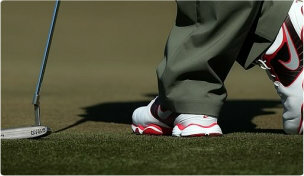 I’ve actually made a big turnaround in my putting since Wednesdays round however. 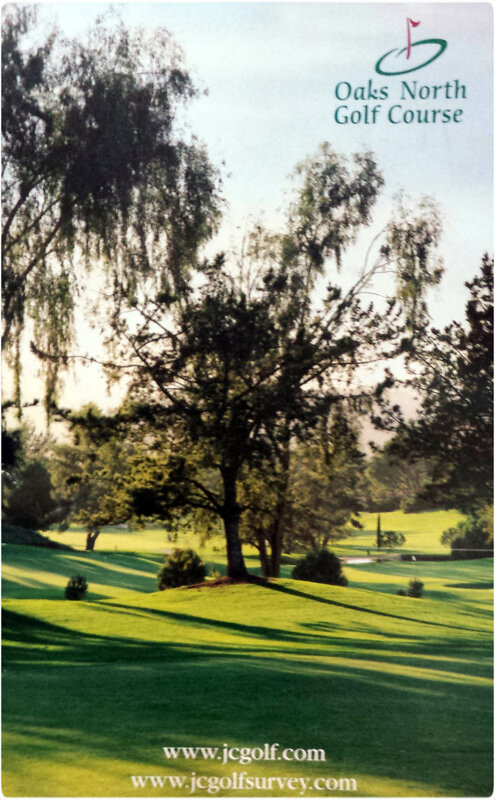 I’m really excited as I’ve been reading Dave Stockton’s book on putting called “Unconscious Putting” and I have had a lot of success on the practice greens since. I’m making a TON of putts right now, anywhere from 3-15 feet and even a few longer bombs. I played an up and down game last night at the driving range: I threw 3 balls toward a hole on the other side of the green and then when I got up there I pulled back the balls a full club length and tried to make the putts as if they were for par. I did this 5 times with 3 balls, so 15 total attempts and all of them I pulled back anywhere from 3-15 ft…I only missed 2 putts!! That’s just insane and I did that on Thursday and Wednesday after my round as well, it’s like a complete 180 turn around in my putting. Stockton talks about just picking a spot about an inch in front of the ball and just trying to roll your putt over that spot. Obviously there is some other stuff involved too, but this has helped me keep my putts online and they are all tracking at the hole now. I’m really excited to see how it translates to scores this next week, I know that if I get confidence in my putting I have the ability to shoot some low scores. I’m going to need great putting in the Palm Springs tournament coming up here in 2 weeks if I want to shoot an under par round there and defend my title. I’m confident in what I’m doing with the putter now and confidence in putting is half the battle…I’ve been close to zero confidence for so long that it’s a huge turn around for me, let’s hope I can turn it into scores! We have some thunderstorms here right now for the next few days, so I won’t be able to play or practice unfortunately till Monday. “It was the best of times, it was the worst of times.” Reverse that and you basically summed up my golfing week. 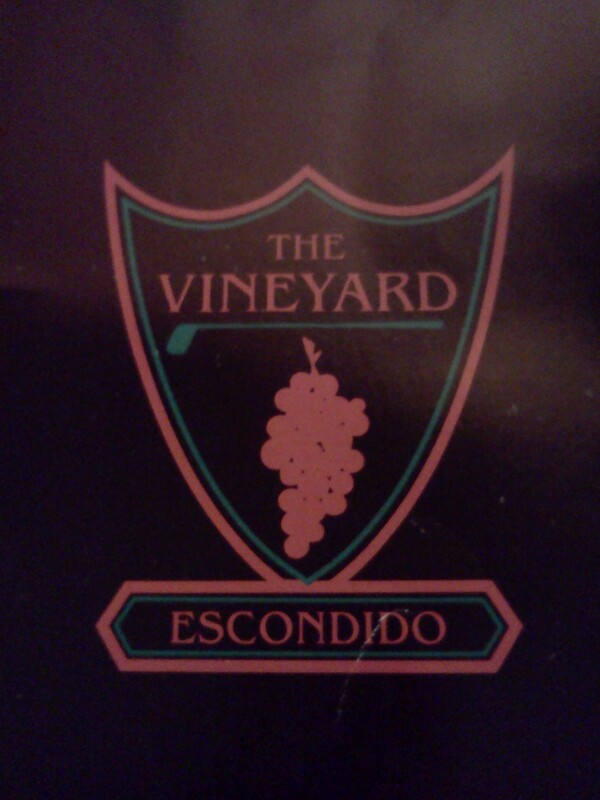 Played a couple rounds this week at my current favorite course the Vineyard and had two completely different rounds. On Monday the 16th, I shot a disappointing 79 (+9). Just didn’t feel comfortable with my swing all day and could not hit it where I wanted. Was missing greens badly even from when I managed to be in the fairways and short sided myself all day. Stats overall actually weren’t terrible; 7 of 14 FWs and 10 of 18 greens, but was only 2 of 8 on up and downs because I was missing short side and had two 3 putts on 15 and 16. After playing so well for the past month with consistent low scores, I was certainly frustrated with this round, but tried to keep a positive mindset and continued to believe in my abilities. On Wednesday, I headed out to the Vineyard again for a redemption round and I found it…shooting a career low round of Even par 70!! In practice before the round I had figured out that I had started to creep a little too close to the ball on my address, slightly adjusted it to standing a bit further from the ball and it made a huge difference. Had it to (-1) heading into 17, but blocked an 8iron into the green side bunker on the par 3. I dropped another ball just to practice and hit it to about 2 feet for a tap in birdie…ughh if I could have just done that when it counted I would have sealed my first regulation under par round!! Nonetheless, wasn’t able to get my first ball up and down from the bunker and bogeyed to drop back to even. I missed so many great birdie opportunities and the two birdies that I did make on the day were long distance putts that obviously I wasn’t really expecting to go in. So it’s kind of funny, when I was actually playing the round I didn’t really feel like I had my best round ever going because I was missing so many makeable opportunities. Missed about 3 or 4 8-12ft uphill birdie putts, only scored a par 4 on the drivable par 4 7th after I had drove it just off the back in 1 and didn’t birdie either of the par 5’s after being near the green in two on both. So as excited as I am to shoot a new career low round of Even, it is frustrating knowing just how many shots I left out there, but I shouldn’t be focused on the negative, there will always be shots you know you should have made and that’s why golf is a mental grind. I’m going to keep staying positive and believing in my abilities and hopefully the results will continue and I’ll squeeze that under par round in here soon. 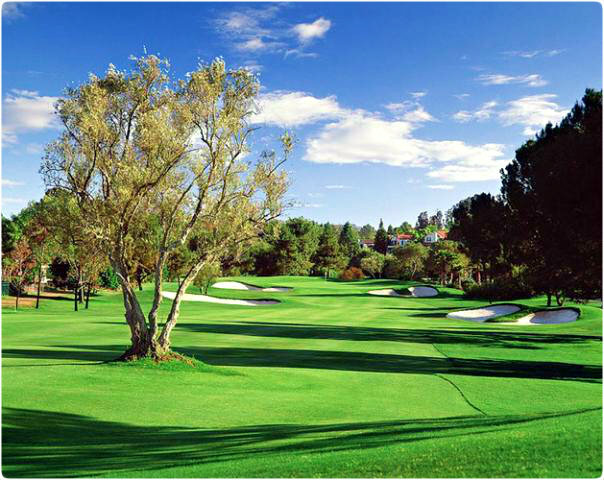 My annual Palm Springs tournament is coming up here in less than 2 months, so I hope I can shoot an under par round before then. One of my goals for 2014 has been to be able to shoot an under par round at the tournament this year, so I’m focused on making that happen. Hey everyone, it’s been a couple weeks since I have updated, but I have been grinding on the course. My game is currently in the best shape it has ever been and I have been consistently shooting low scores. My iron game has been spot on as of late and I have been working a lot on my short game, my chipping and pitching game in particular and the results are starting to show. My proximity to the hole with my wedges has greatly decreased, sticking it in close lately. My putting is still not anywhere close to where I would like to see it, I’m continuously tinkering with my grip/set up and just have not felt comfortable with any style in these past few weeks. I’m still 3 putting way too often and I am not taking advantage of my better wedge play by making many birdie putts. I have missed a ton of great birdie opportunities from inside 15ft during the past few weeks and it has cost me my first under par round on more than one occasion. With the exception of today, I have been regulated to going out and playing by myself over the past month as my friends have been unable to really get out and play recently. As a result, I have mostly just been going to my favorite courses, the Vineyard a few times a week or the executive Oaks North. The rates are extremely cheap, the conditions are amazing and I’ve figured out great times to go when it’s pretty wide open, so I know the pace will be quick. I’ve been making a conscious effort to play with better course management and that means not hitting many drivers off the tee. My driver has still been pretty inconsistent, I am hitting it pretty solid each time, but just can’t consistently trust that it will go straight and my miss has been both ways. My 3 and 5 woods have been awesome however, I have just been crushing those and so for right now, unless I really need to hit driver, I’ll go back to those and it has helped my scores. I have been hitting my 3-wood anywhere from 270-300 yards at the moment, it’s crazy to think it can go that far, but it is and with a ton more accuracy than the driver, so I’ll stick with it for now, until I figure out this driver. 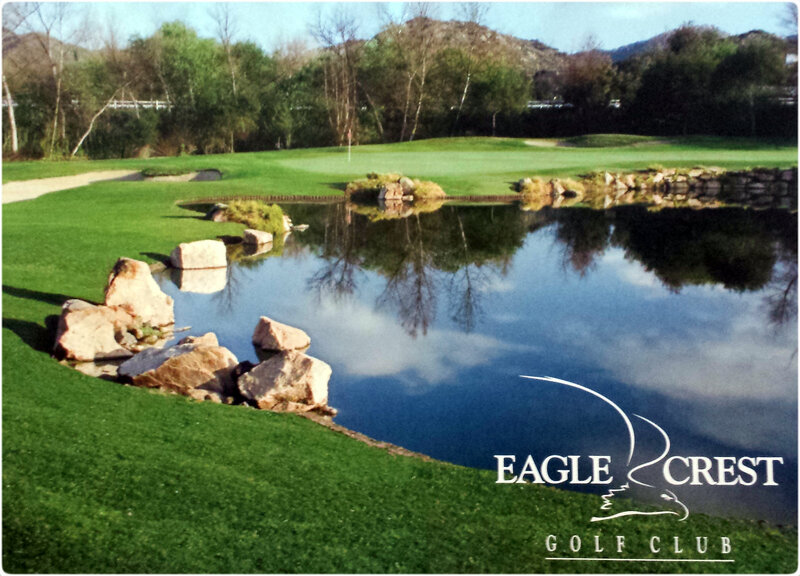 Today, we played the difficult Eagle Crest golf course (Par 72 71.7/133 6,537 yards). I’m very disappointed in my putting performance today, but overall I’m very happy with how I hit the ball, I continued to strike the ball well. I shot a 77 (+5) with four 3-putts and 2 out of bounds off the tee on par 5’s. To still shoot +5 total with those stats is impressive in my book. My lag putting was just really bad, I didn’t have any 3 putts until the back 9, but my lag putting ability just disappeared and I was leaving it a good 8-10ft short…just not keeping my head down and striking solid putts. I’ll be playing again tomorrow at The Vineyard with my buddy Andrew Le who is coming into town, his brother and another friend. I’m excited to see them all again and it should be a really fun round. 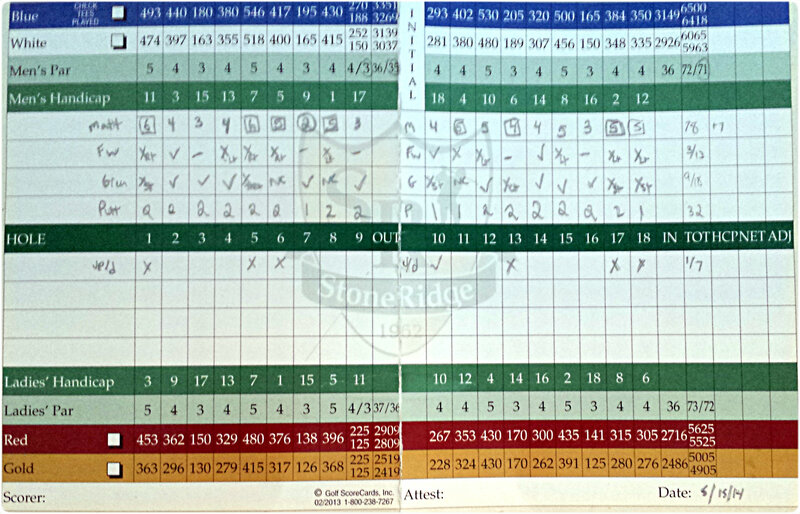 Since it has been awhile, here are my scores and stats from my last 5 rounds, including today’s Eagle Crest round. 2014 Oggi’s Tournament…(-17) 55 1st Place and New Tournament Record! If you look back at my post about my 2014 Golfing Goals, one of them was to win our annual work golf tournament. My team had shot (-10) both the last 2 years and we had finished in 2nd and 4th place respectively. I’ve wanted to win this tournament so badly, not only for the bragging rights, but to actually have the championship go to a team of employees as this tourney is in honor of our late owner who loved golf. I have been working so hard on my game over this past year, as you all know and this moment has been on my mind the whole time. Our goal was just to improve on our consecutive (-10) 62’s and hopefully break into the 50’s and with any luck a shot to win. Well I’m happy to announce that we accomplished our goal and then some! We absolutely destroyed the course, scored an unreal (-17) 55, set a new tournament record and won the tournament by 3 strokes!! It was an unbelievable day, our whole team stepped up clutch in every situation we found ourselves in, I’m really proud of my team. I started off pretty wild, slicing both my first tee shots out of bounds, but thankfully one of my teammates hit solid drives on both. We started on hole #7 which is the #1 handicapped hole, we had a pretty long 2nd shot of about 220 from the rough, but one of my teammates hit a beautiful hybrid to about 30ft above the flag. All 3 of my teammates putted, missing the birdie, but giving me a great read, I stepped up and drained the long birdie putt…a Tiger Woods fist pump ensued and that gave us big momentum and started us off on a crazy streak of 15 straight birdies!! We were sticking it close on almost every hole, inside 10 ft and we made basically every putt. We made 3 putts from over 25ft, a couple when it was our final putt, just clutch to keep the birdie streak going. I don’t think any of us expected to play this well overall, as I’m the only one on the team that breaks 80 and one of our players hadn’t even touched a club since last year’s tourney, but those guys played so well, it was truly a team effort and I’m so happy to be able to cross another item off my golf bucket list! We were kind of disappointed we couldn’t complete the perfect round and birdie all 18 holes, but we just couldn’t convert the birdie opportunity from off the green on the difficult par 3 4th (Our 16th hole). 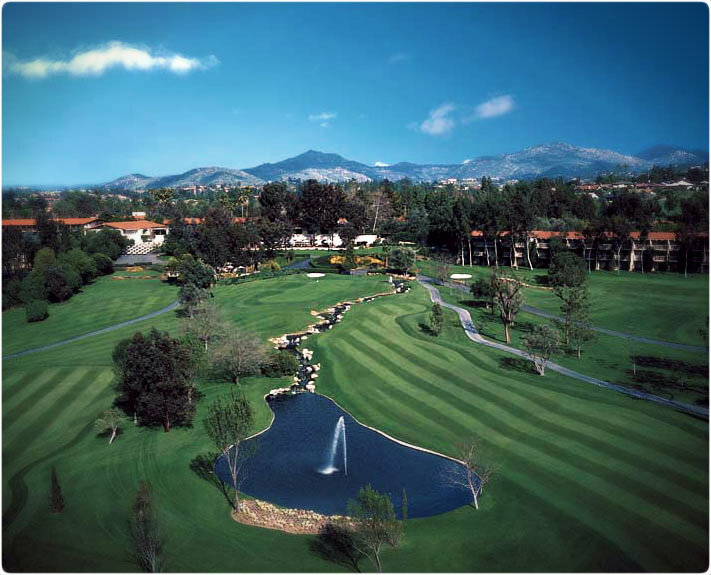 We won some pretty cool prizes as well, one of which was 4 complimentary rounds to the host course, Rancho Bernardo Inn ($85 each). Pretty awesome as this semi private course is just in perfect condition right now. It’s a very fun and challenging course and it has hosted both PGA and LPGA events in the past so I look forward to being able to play it for free soon! 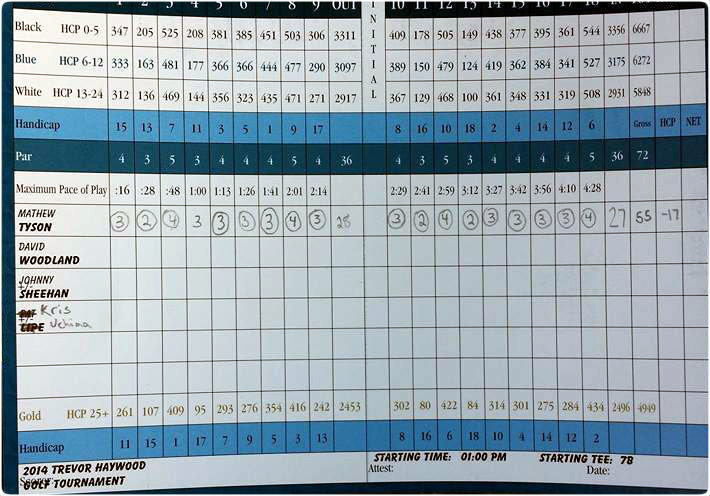 I’ll post some pictures from the event when they get posted from the photographer here in a few days, but for now here is the picture of our almost perfect scorecard, what a round! 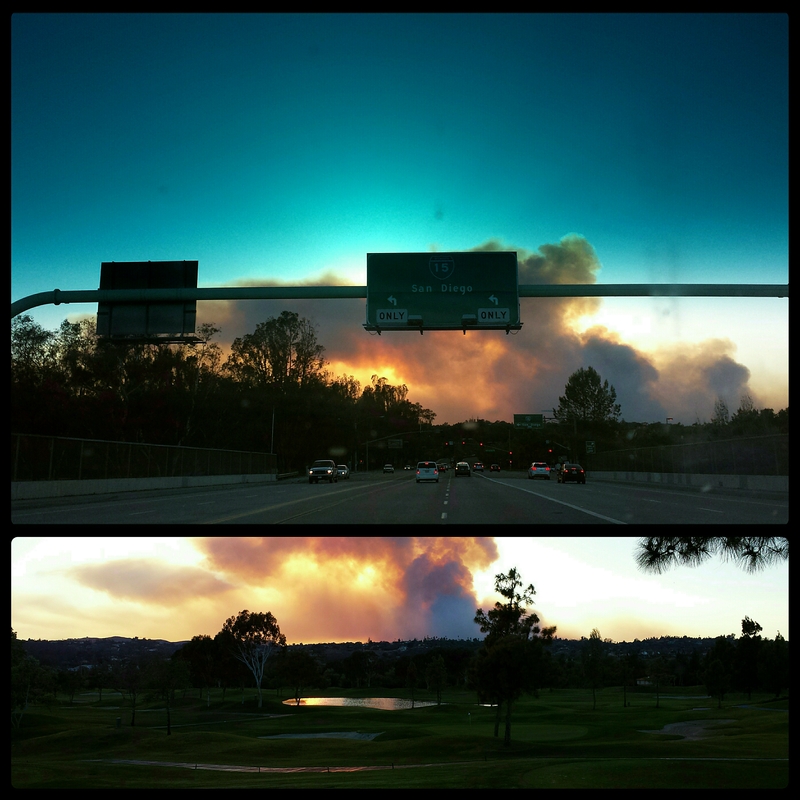 On Wednesday, most of the northern San Diego area was hit with multiple wildfires as temperatures soared to a dry and blistering 100 degrees with sustained winds up to 40mph. My part of town was relatively safe, so I decided to get out of the house and go play a round to get my mind off the news. I headed to the Vineyard and of course it was petty wide open as most people in the area were more concerned with the news than golf. I didn’t keep my score as I just listened to my iPod and played 2-3 different balls on each hole just practicing different shots all day long. We have our work tournament coming up here on Monday the 19th, so it was good to get in a lot of real course practice. I hit the ball alright, not as great as I would like to right now or have been lately, but I’m still feeling good going into Monday in my ability to help my team score low. I’m going to have to drive the ball well and have solid iron play to give us makeable birdie chances. Most of the work will fall on me if we want to shoot low, so I’m hoping to have some solid range sessions this next few days and hopefully be able to play at least one more time before Monday. Going back to Monday this week, found some posted tee times on GolfNow from a private club in my local area. 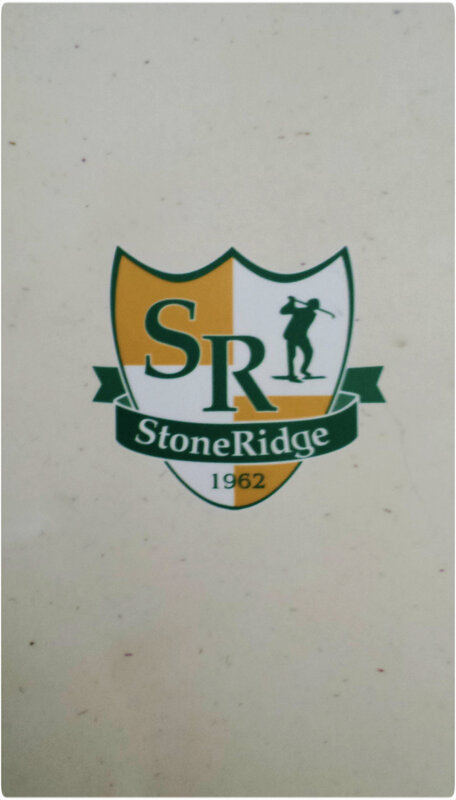 I guess StoneRidge golf club only posts times on Monday afternoons on GolfNow, so it was a nice treat to be able to snag one of them. I had played here a few times before many years ago growing up as one of my friends dads was a member and took me along a few times. If I’m being honest, the conditions were quite disappointing…the chipping areas around the greens and the greens themselves were in excellent conditions, but the fairways and rough were terrible. The tee boxes were uneven and patchy, not something you typically see from a private club. 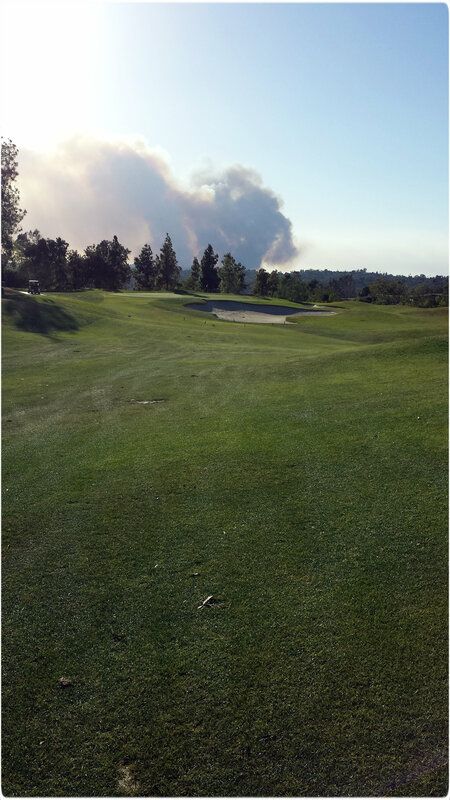 I’m sure this recent drought we are having is making it difficult for their maintenance, but I see public courses like Vineyard or Woods Valley which are in excellent condition and cheap and it makes you wonder. StoneRidge is still a nice and challenging track however with a lot of elevation and dog-legged holes. Since my course experience here was so long ago, it felt like I was playing the course for the first time and gauging distances on dog leg holes with no course experience is a difficult challenge. It cost me on more than a few holes as I was left with absolutely terrible angles into greens. Factor in the 20mph wind gusts and this made for a challenging driving day, in which I failed miserably…only hitting 3 out of the 13 FW’s on this Par 71 track. I stuck it within 15 ft on every Par 3 however, hitting nice cut shots into each, but only walked away with 1 birdie. I did avoid any big numbers however and finished the round at a solid 78 (+7).